DiFattaMagic is pleased to present you the amazing new "Bicycle - Color Collection". A fine maxi-transparent box with 9 Bicycle decks in 9 different colors. Inside we have added our latest yellow deck and the following brand new exclusive colors: violet, borwn and grey. This new collection was created by our company, to enrich our collection of colored Bicycle decks creating a perfect gift box for card enthusiasts. Bicycle Color Collection is a world exclusive by Vincenzo Di Fatta and a “must have” selection! - The environmentally friendly maxi-transparent PET box, measures cm 25 (9,84") x 32,5 (12,8") x 2,3 (0,9"). 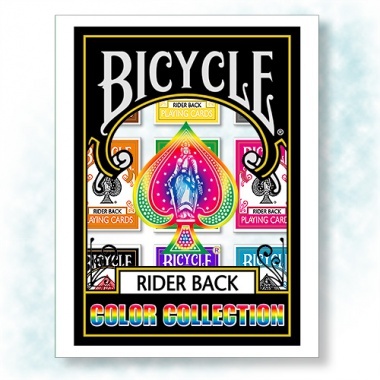 - It contains 9 Bicycle decks in the following colors: Brown, Yellow, Gray, Orange, Green, Fuchsia, Black, Purple, Turquoise. Each deck is enriched with special cards that allow fantastic magical effects (video instructions available online).